The U.S. Fish and Wildlife Service is now examining whether five species of large, non-native constricting snakes, all judged by the U.S. Geological Survey to be an ecological threat, should be listed as "injurious" and prohibited for import or interstate trade for use as exotic pets. At The HSUS we are hopeful that the agency is now in the final stages of passing this rule that would help restrict the private trade of millions of these wild creatures via the internet and through pet stores in the United States. In 2012, the agency listed four species as "injurious" – the Burmese python, Northern African python, Southern African python, and yellow anaconda – but punted on five other species that also should have been classified similarly. That latter group – the reticulated python, DeSchauensee's anaconda, green anaconda, Beni anaconda, and boa constrictor -- represented about 70 percent of the trade in large constricting snakes. It's time now for the Obama administration to finish the job, stopping a reckless trade that results in snakes dispersed in our communities and ultimately leaving a major ecological wake. According to a National Academy of Sciences report, certain small- to medium-sized mammals have declined by 99 percent in surveyed areas of Everglades National Park, with Burmese pythons considered the likely causal factor. Dogs and cats were domesticated for thousands of years, and they have a place in our homes. The large constricting snakes we are talking about are wild animals, native to Africa, Asia and South America. While we agree that they are fascinating and remarkable animals, they are best suited in their native environments, and they don't belong in the wildlife trade or in our bedrooms and basements. They die during capture and transport. In the end, too many people get them and then tire of them or realize that they do not have the resources, space and expertise to care for them properly, and release them. Some of the snakes adapt to the wild, becoming invasive species. Boa constrictors, the most popular of the nine large constrictor snakes in the pet trade, are predators who can grow up to 13 feet long, and they can and have killed large mammals, including humans. They have now become established in Miami-Dade County and Puerto Rico, and if they become established like Burmese pythons have in south Florida, they could cost the nation tens of millions of dollars in eradication programs – to say nothing of the effect on native species of birds and small mammals, including endangered ones. The HSUS has tracked more than 500 human safety incidents involving large constrictor snakes that include attacks, intentional releases and escapes from poorly secured cages. 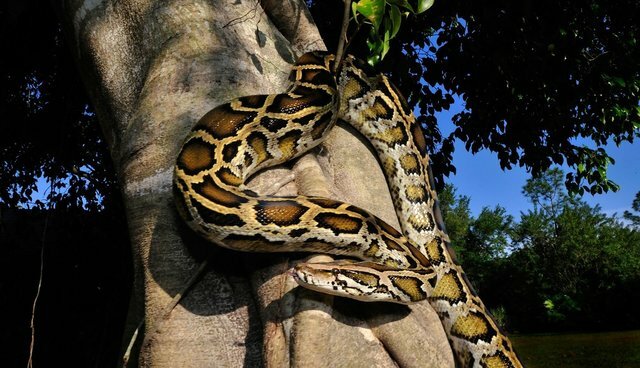 Boa constrictors and reticulated pythons have already killed five adults and three babies, and the danger continues to escalate. We are hopeful that the U.S. Fish and Wildlife Service will end, once and for all, the inhumane trade of these beautiful, wild creatures who never should have been drawn into this trade in the first place.